Raising creative children can seem like one more box to check off on the parenting to-do list. It’s tucked somewhere between making sure they have decent table manners and making it through the grocery store without having a major meltdown. It can be overwhelming to add one more item to that parenting to-do list, and raising creative kids can get placed on the back burner for a variety of reasons. Maybe you are uncertain as to how to go about providing creative opportunities for your children at home, or perhaps the idea of a “mess” that comes along with the combination of creativity and kids feels extremely overwhelming. Spending creative time with your kids provides the opportunity to take it slow, dive into a deeper conversation, and take a moment to enjoy time together. Creating art together can bring a sense of calm to the body and positively impact your mood. Expressive arts awaken a child’s imagination and creativity to help discover who they are and how to engage. People don’t realize it, but creating art often follows a process of planning, adjusting, and problem-solving. 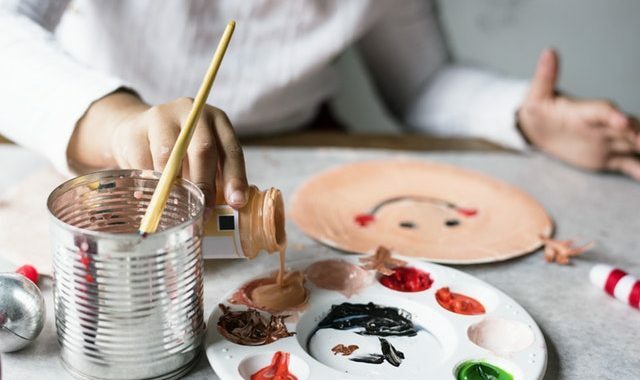 Below are 5 tips to embrace the mess and connect with your kids through creativity. You could make art at your kitchen table, kitchen counter, on the floor, or you may have an entire room dedicated to art-making. However you go about selecting a space in your home, try and make it consistent. Having one location in your home where the art making happens creates natural guidelines for children and helps them learn your expectations of behavior and conduct. You can contain your supplies in a variety of ways according to your family’s needs and the available space. You can store your items in plastic storage boxes, on a moveable cart, or on a shelving unit. Include your children in the process of what they want their art time to look like. where the mess takes place. With a mindset of keeping things simple, you will find setting up art experiences for your children won’t require a ton of time and won’t cause your children (or you) to end up in tears either. Offering very specific supplies creates a structure for you and your children to work in, which will increase your children’s creativity and improve their focus by keeping overwhelm at bay. Keeping your overall supply cabinet limited to your favorite markers, crayons, watercolors, and paper can keep the art experiences less demanding, and simpler overall. a rhythm for them to know what to expect. children deeper as they make connections and keep their focus on concepts shared in the story. you to connect and create positive memories together. Remember: there is no right and wrong in art. If your child colors the sun blue, there is no need to correct your child or encourage him to fix it. Avoid the temptation to offer your suggestions and ideas for improvement. You can be the art director for your piece of art and allow your child to make decisions on their own piece of art. Avoid “helping” your child with their artwork. Encouraging your child to complete their project independently can help foster frustration tolerance, problem-solving skills, and ownership.